Hi everyone, today I'm here for Craftie Cafe and I have a Halloween card to share with you all. We don’t really celebrate Halloween here in Australia, but we thought we would inspire with some Halloween projects anyhow! For my card today I’m going to just be using dies. 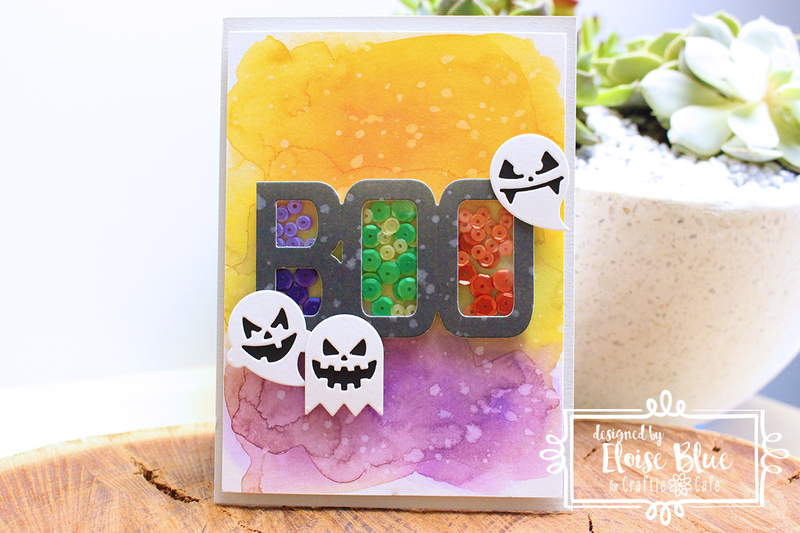 I’m using the Boo Dies and Ghosties Dies from Impression Obsession along with some of the brand new Distress Oxide Inks and making my sentiment into a sequin shaker. To begin my card today, I started off with creating the sentiment. I took some watercolour paper along with the Black Soot Distress Oxide Ink and ink blended some colour at the bottom of the paper. I then flicked it with some water, dried it and ran it through my Big Shot Machine with the ‘Boo’ die on top. I then used the remaining white cardstock left over on that piece to run through with my Ghosties dies. Once everything was cut I could assemble my shaker piece. I cut down a piece of acetate to fit behind the ‘Boo’ word and adhered it down into place. I then used some 3M Foam Adhesive to put around the letters, to make individual openings. I also layered it up twice so the sequins would fit better. Once I had sectioned off my letters I used some Pretty Pink Posh to fill in my gaps. I used some 4mm Pansy Purple, 6mm Amethyst, 4mm Lime Sorbet, 6mm Shamrock, 4mm Tangerine and 6mm Pumpkin. All in coordinating Halloween colours, so it would eventually match my background. Once I filled in all the holes, I closed it back up with another piece of acetate over top. Next up I could work on my background. I used the Twisted Citron, Spiced Marmalade and Wilted Violet Distress Oxide inks and ink blended them onto my background. These colours don’t really mix well together, but I just made sure they didn’t touch too much and it worked out fine. Then I took some water and spread the colour out a little, making it seem like it was water coloured. I then heat set it with a heat tool and then splattered some water over top to create the water splotch effect. I adhered on my shaker word sentiment and adhered the ghosts. For the ghosts I added some black cardstock behind their faces so it would show through black and not purple and orange and then adhered them down with some foam tape, also. I foam mounted my panel onto some light grey cardstock and then adhered that down onto a white card base. Thanks so much for stopping by today, I hope you enjoyed. 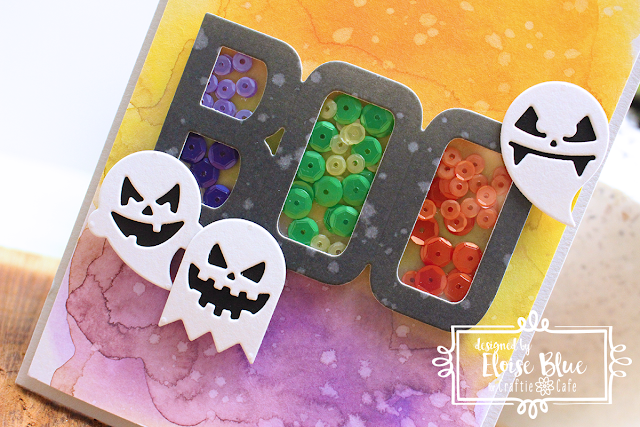 Halloween cards are so super enjoyable to make, the colours are just so fun to use!